Manual staff scheduling and attendance tracking is a thing of the past with Hubstaff. Automatically track hours and attendance so that you know when and how long each team member has worked. The Hubstaff online schedule maker makes it easy for staff to see the shifts they are working and automatically tracks attendance when the employee clocks in. Get all your employees on the same page so that everyone knows what the work schedule is, what they’re working on and how much time they should spend on a project with weekly time caps and task assignments. Our online schedule maker not only gives management and staff insight into shift coverage but also helps to keep budgets and work schedules on track. 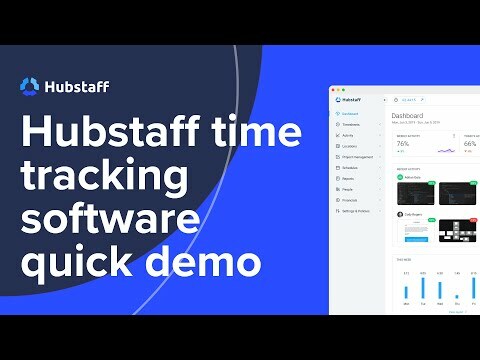 Hubstaff time tracker runs as software on your desktop or as a mobile app making it easy to track time. Once the time is tracked you can invoice clients, pay employees, see in-depth reporting and much more.Over 8,000 remote teams use Hubstaff daily. We provide simple but effective employee time tracking software for Windows, Mac, Linux, Chromebook, iOS, and Android. Our lightweight desktop timers take screenshots and measure activity levels so you can monitor your remote employees. Our mobile apps let you track time working or driving and offers fleet or employee location tracking via GPS. Hubstaff time tracking allows contractors to track time to individual projects (unlimited projects allowed). Managers can log in to see how much time has been spent on those projects, who is currently working on them, and their activity levels. Manual staff scheduling and attendance tracking is a thing of the past with Hubstaff. Automatically track hours and attendance so that you know when and how long each team member has worked. The Hubstaff online schedule maker makes it easy for staff to see the shifts they are working and automatically tracks attendance when the employee clocks in. Get all your employees on the same page so that everyone knows what the work schedule is, what they’re working on and how much time they should spend on a project with weekly time caps and task assignments. Our online schedule maker not only gives management and staff insight into shift coverage but also helps to keep budgets and work schedules on track. Set up staff schedules in advance so that your teams know what projects and tasks they should be focused on. Easily create new projects and recurring tasks as well as smart notifications for missed or late shifts and days missed. An employee schedule maker should be easy to manage and transparent to staff and with the staff scheduling features of Hubstaff your business will get both. Smart online employee scheduling and attendance tracking that helps you know who’s working when. Hubstaff makes shift management simple by giving you the ability to add your team's one-time or recurring shifts to the work calendar with ease. Q. Are there larger plans? Yes we do. We can serve any size team. We have plans for up to 200 users. If that's not big enough please contact us and we will setup a plan that is right for you. Q. How are users counted? Q. Can I invite clients?